Lately I have been caught in the texture of silence. As a musician, I spend almost all of my time making sound. Bright sound, Rough sound, Quiet sound, Sensual sound… But as my art progresses I have become increasingly captivated by the texture of no sound, the texture of the rest or breath mark. This lack of sound has always been a topic of discussion. Throughout my studies it has been referred to as silence, or pause. But as I was canning tomatoes this summer (a Quiet and Meditative time for me) I realized that silence has texture, just as sound has texture. This has provoked new imagery for me. A rest is no longer a pause. And a breath mark is not just a space to breathe. There is texture to the rest and to the time of the rest. Rests can be Arrogant, Questioning, or Robust- an emotion so strong it feels tangible. And the emotion can give way to texture; a moment so Thick it feels like a humid summer day OR maybe it is Rough like gritty sand paper. 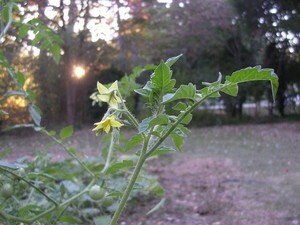 One of My Tomato Plants Silently Blooming. During my last solo live performance, I realized all of these moments of textured non-sound are heightened by the human experience. By the human experience, I mean- the camaraderie with the audience in an onstage moment, the adrenaline that alters the perception of time and texture- and the texture added to “silence” by the audience. I have a feeling that this is only the beginning of my thoughts on non-sound but I break my Blog silence to open my thoughts- and find the texture of sound and non-sound equally.